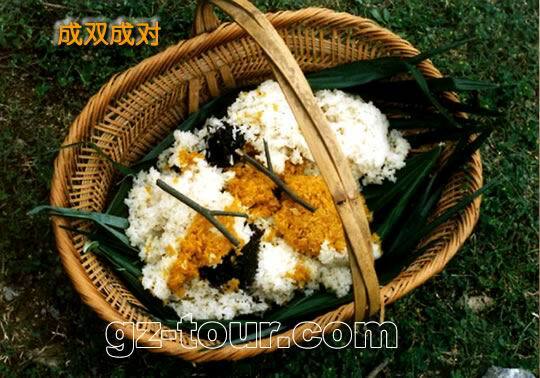 The Sisters Festival (also nameds the Sisters' Meal Festival) of Miao in Taijiang Begins on the fifteenth day of the third lunar month, when unmarried women harvest rice from the terraced fields and gather together by the river to prepare it.The rice is cooked until it has a sticky consistency and is blue, pink, yellow, and white to represent spring, summer, fall and winter. 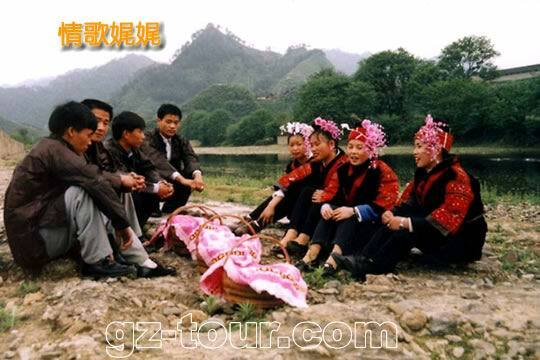 The young women then place some of the rice in small bundles of cloth as young men arrive and begin to serenade them. Each young man singles out the woman he hopes to marry someday. Although he sings about his hunger and thirst, his real meaning is: "I love you, do you love me?" 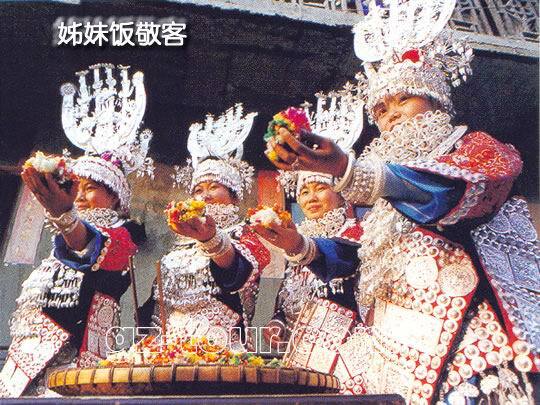 The young woman responds to his song by giving him a drink of rice wine and some rice wrapped in cloth. Her official reply is inside. If she has placed a hot pepper there, it's a flat refusal; one chopstick signals a more polite "no-thank-you" to his love. If he finds a leaf inside his bundle, he must first give her satin; and a piece of grass implies he must first supply her with a needle and thread before she will signal "love you too" with two chopsticks. For those who have already "exchange two chopsticks" at the river, the festival is also a time for married women to return to their parents' home. This is the only time that daughters see their parents and the one occasion that sisters sit down together all year. The rest of the days are spent with their husbands' families. Women arrive on foot laden with chickens, rice cakes and bolts of hand-woven cloth for their families. Their husbands remain at home. 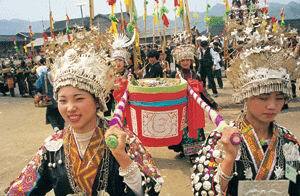 Copyright © Hmong Home in China China Silver Dragon Minority Culture Development Department.